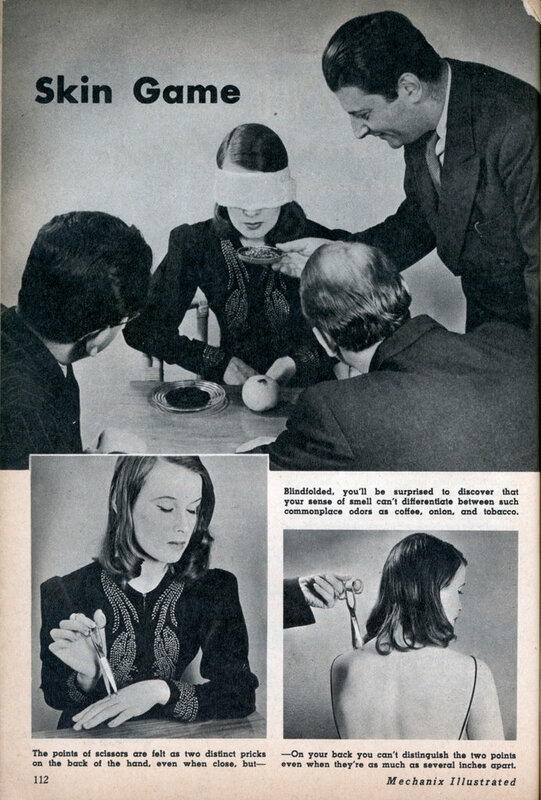 AS YOUR senses must work together to convey an accurate impression to your mind, you’ll be surprised at the many ways you can fool yourself and others with a few simple experiments. If one of your senses is prevented from contributing its proper share to the mental picture, you may find the work of the others startlingly incomplete or fantastically incorrect. Try it for yourself by performing these amusing tests with everyday things. Your breakfast coffee and your favorite cigarette can become total strangers to you if you don’t watch out. I don’t happen to have a volleyball bladder handy but it didn’t work for me with a balloon.